SpongeBob has some ideas. . .
Good God darling, I hope this isn't rectal! I'm very disappointed that this is your only post tagged with the "rectal thermometer" label. Give me time, Kevin. Give me time. . . I mean, now that the CA Supreme Court has basically said I can legally do whatever depraved thing I want, the doors are WIDE open. 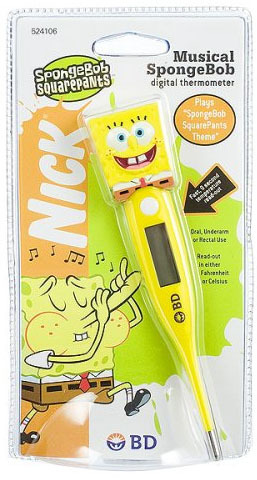 My cousin purchased this fine specimen of a thermometer for her infant son (her husband works for Pixar and she thought he would appreciate the functionality of cartoon character)---to her delight, Sponge Boy plays his theme song when the temperature is registered....bloody brilliant!